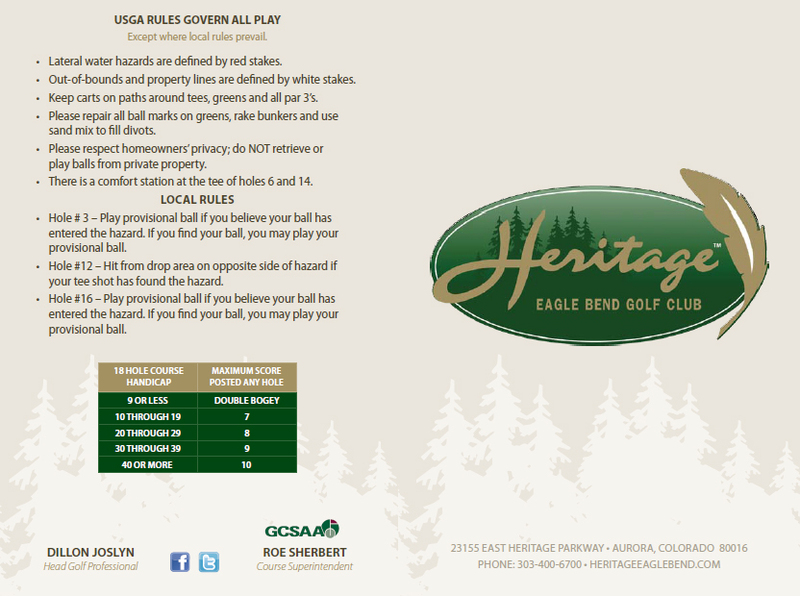 Beautiful Aerial Layouts Of All 18 Holes At Heritage Eagle Bend Golf Club! A wonderful view of the surrounding area will start your day from the tee box of this 385-yard, par 4. This hole will allow the golfer to ease their way into the round. With a relatively level green a good score can get you off on the right foot. Don't let this green factor into your decision for the following 17 greens. Playing downhill and normally downwind this par 5, 576-yard hole can add to the good start on hole #1. Carry the left fairway bunker and you will be left with a relatively short second shot. The fairway ends and begins again so pick you aiming spot carefully. Short and right is ideal as a large bunker on the left guards the majority of the green. This par 3, 182-yard hole is the first real test of shot making. It plays along a ravine that wraps around the entire backside of the green placing a premium on club selection. Aim for the center of the green as there are bunkers guarding the front and a shot long means a big number. A Players Hole! At 396-yards, this par 4 will test both your drive and approach shots. Keep the driver in the bag and play a long iron or 3-wood to the front of the lake. This will leave about 135 - 150 yards to the green. The lake wraps around the back of the green, so stays short and left of any pin location. Three bunkers guard the fairway on this par 4, 422-yard hole. Carry the left bunker with a slight fade and you will discover the majority of the fairway. The green is one of the largest and longest. Calculate your yardage correctly as this three tiered green can guarantee a three putt if in the wrong place. At 527 yards, this par 5 plays uphill and into the prevailing wind. Play your drive down the right side to avoid the deep fairway bunker. A properly placed second shot should leave you with a wedge into one of the smaller greens on the course. Playing slightly downhill at 183 yards, this par 3 appears easier than it plays. With a large mound running through the middle of the green, being on the side of the green with the flag is essential. Take dead-aim. Play your drive short of the right fairway bunker and you will have a relatively flat lie on this downhill fairway. The longer hitter can play to left, but beware of the high native grass. An approach shot from the fairway on this 420-yard, par 4 is a must to hold this small green. This par 4, 397-yard hole presents a challenge to the big hitter. Do you try to carry the large fairway bunker or play safe up the left side of the fairway? Whatever the decision, a tee shot in the bunker could mean a big number. A high "Nicklaus Style Fade" is ideal into this green that is hidden to the left of the false front. At 398 yards, this par 4 plays shorter than it looks. Play your tee shot to the left center of the fairway for the best view of the green. Keep your approach shot to the right of the green as a water hazard looms to the left. At 597 yards, this par 5 is the longest hole on the course. A big drive might give you a chance at hitting the green in two, but a missed second shot long or right can spell trouble. You will have great view of #12, #13, and the Rocky Mountains from the top of the hill. Lay up to 100 yards and trust your wedge play. Playing across and along a ravine this 207-yard, par 3 places a premium on accuracy. The majority of the green is hidden behind the right bunker. Your shot is playing slightly up hill, so take an extra club and swing smoothly. Most likely the hardest hole on the course this 423-yard, par 4 plays uphill and into the wind. Play your tee shot to the right of the first bunker to get a level lie. Completely blind second shot needs to be played slightly to the right of the highest point in the fairway. You are better off long than short on this hole. You can make up some ground you may have lost on the last hole on this 506-yard, par 5. Playing downhill, hit your tee shot just right of the bunker to get the maximum roll. The only trouble lies short and to the right of the green. Be careful not to fly this green, your approach shot will play shorter than it appears. Picking the right club is essential! With water fronting the green and a steep slope guarding the back make sure you hit the green. At 194 yards, this par 3 owns the largest green on the course. Two-putt and move on. Don't try to bite too much of on this dogleg right par 4. Hit your tee shot at the first bunker and you will have 150 yards left for your approach shot. There is a ridge that bisects the green so make sure you take into account for the days flag location. A great view of the finishing hole is to your right. Don't get distracted you still have to play this 456-yard, par 4 ... Everything slopes to the right. A tee shot hit at the fairway bunker will kick you into good position to attack this 3-tiered green. 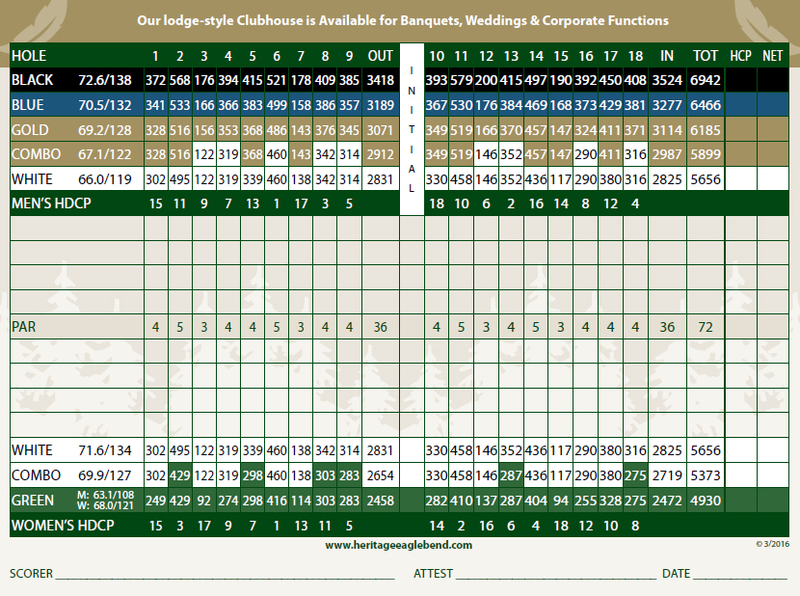 Playing downhill and with the wind usually behind, calculate your yardage correctly. A long shot is trouble! The final climb to the Clubhouse. At 426 yards, this uphill par 4 requires an accurate tee shot. With bunkers guarding the fairway, hit your tee shot at the flagpole and leave the bunkers for the next player. The front edge of this green is misleading; the majority of the green is over the bunkers. A missed approach is best to the left; rely on your short game to par this great finishing hole. Video Of The Club At Heritage Eagle Bend Golf Club From All Different Angles!